Product information "Bald ist Weihnachten"
During the most wonderful time of the year, gifts - especially home-made ones from the kitchen - are particularly appreciated. This book is a culinary guide through the Advent season, and shows through many recipe and packaging ideas how you can bring joy to family, good friends, nice neighbors and colleagues, and do so every day and for any occasion. From date macaroons and spice cake for the Advent coffee break, chocolate lollipops and crunchy nuts for St. Nick's boot or spiced wine jello and goose liver pate for a gift exchange or as a Christmas gift. Stroner is a successful author of books on cooking and baking. The titles Home-Made & Brought Along and Gifts From the Summer Kitchen have been published at KOSMOS. 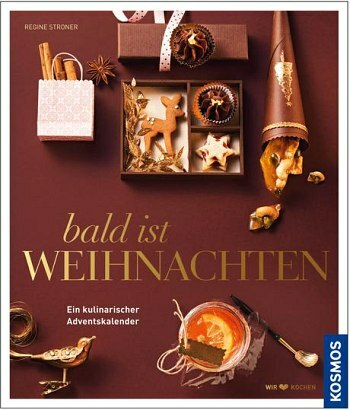 "Regine Stroner, successful cookbook and baking book author, has already published Soon It Will Be Christmas"" and ""Make A Wish"" with KOSMOS. She runs a restaurant together with her husband, and also imparts her culinary knowledge in cooking courses and workshops."""